Warner Brothers | Ty Templeton's ART LAND!! Memorial Weekend Bun Toons! YAY! Next weekend, when Diana’s adventure opens, and we find out if hope triumphs over experience, I’ll be in Niagara Falls for a convention, but I’ll try to get out to the movies and report back as soon as I can. I figure after thirty-eight bombs in a row, Warner Brothers is due for a good one. I have a TEEENY bit of connection to this new Wonder Woman movie, I did a quick promotional film for the Cineplex chain, here in Canada. Unfortunate movie goers have been trapped in a theatre with my face fifty feet high, for the last month or so…this is what they were forced to watch. And now, your BONUS Bun Toon for the week. For last week’s comic book themed look at the Trump presidency, click the headline above. Movie Magic Bun Toons! YAY! Wonder Twin Power…shape of a…. I can’t say it in a family webtoon. See you at the movies, gang! It’s hardly the first time the Super-Friends have behaved like a bag of crotch rockets. Here’s how they treated their beloved team mates Wendy and Marvin when they found NEW friends. No joke. This was the last appearance of Wendy and Marvin. They were never heard from again. I think they became homeless and had to eat the dog. For last week’s Bun Toons (re-runs but good ‘uns) click here. 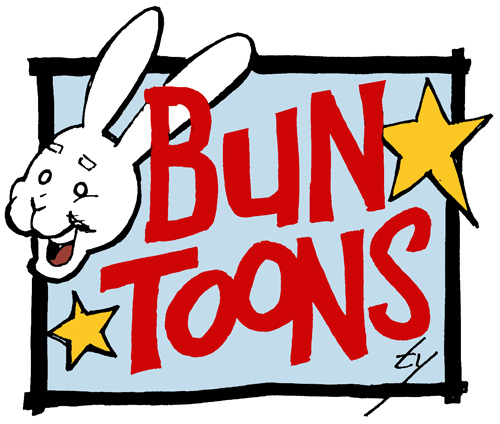 For the bun toon archive of days gone by, click here. Icky Personal Bun Toons! YAY! It’s only fun until someone loses an eye or something. 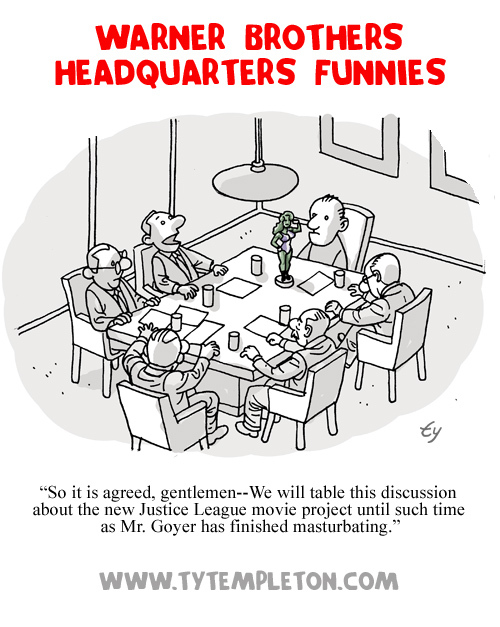 …aaand that’s why we can’t have good DC Comics film franchises. If you’re not familiar with David S. Goyer, or his delightful take on comic fandom, DC characters or She-Hulk in specific, you can go here and breathe it all in like a fine bouquet. Just remember while you’re reading it, that Mr. Goyer is in charge of the DC movie universe. I hear the new X-Men picture is pretty good. Why was I dressed like a Spider-Bunny last week? There’s only one way to find out, true believers. 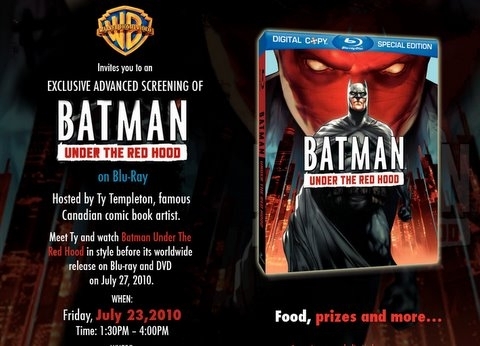 Ty won’t be doing a Hoverboy Friday entry today as he’s a busy guy–he’s off to host a press screening of “Batman Under the Red Hood” (for any press not lucky enough to be wandering around San Diego Comic Con at the moment). Check out the invite below (he was amused at “famous Canadian comic book artist”–clearly the publicist hasn’t seen “How to be Only Mildly Famous and Moderately Successful just like me“). Keiren too sick and tired to be the slightest bit amusing.